The scene begins with Satan leading a man before God’s throne. 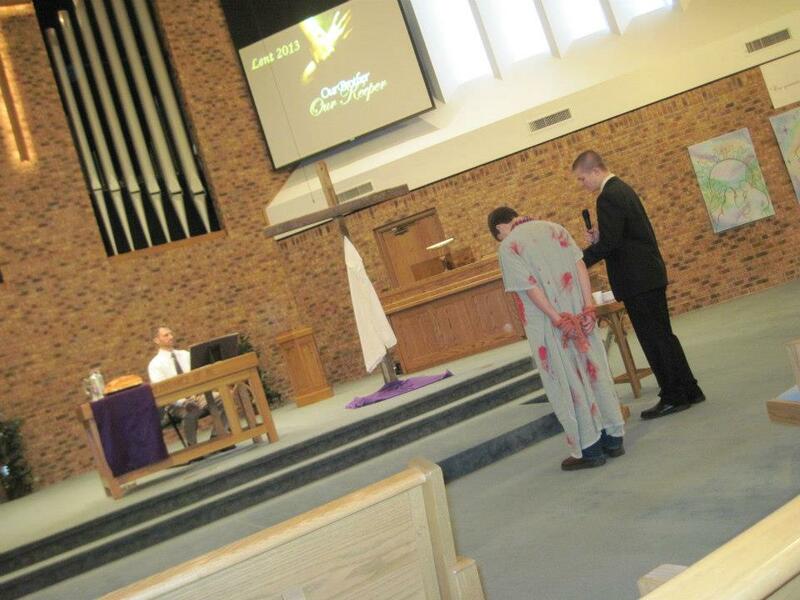 The man is bound and dressed in a robe that is stained with splotches of red. The dialogue is between Satan and God as the man simply stands in silence awaiting his judgment. God: Satan, you come again to accuse. Who do you bring before me today? Satan: I bring another wretched sinner. His name is of no consequence. God: Tell me his name. It is of great consequence to me. He is my creation. Satan: If you know him, why must I say his name? that you acknowledge his name, a creature made in my image. In your great knowledge, you know I speak no lie before you. the selfish manipulations played to get his way. As the evidence will show, and I have plenty, he is guilty. Guilty. In your infinite wisdom and holiness, no other verdict will be possible. God: Matthew, you come alone. Is there no one offering a defense on your behalf? Satan: Who would give defense? His friends? His family? Any human for that matter? God: So, he has no defense? standards? Isn’t this your court, the court of the most holy and righteous God? If that’s the standard, who dare stand before you and give defense? Guilty is the only plea to enter. He’s guilty! God: Guilty is his plea? So, he acknowledges his guilt? life. It is piled high with sin. Where should I even start? God: I think we should start by acknowledging the truth. soul. Letting you see the truth. their eyes. You desire to consume lives, to enslave them to your eternal darkness. because there is no truth in you. You only speak lies, because you are the father of lies. Satan: Do I not speak the truth about his guilt? God: You speak what is advantageous to your destructive ways. He acknowledges his guilt, so you seek to destroy him with it. will see no need to repent. Satan: But in my defense, do I not speak truth about his guilt? God: You do not speak truth about me – of who I am, of what I have done. Satan: Are his sins not apparent to you? Are you blinded by your own light? His sins are like scarlet? He is stained with sin. He is not clean. God: Though Matthew’s sins are like scarlet, they shall be white as snow. and forgiving wickedness, rebellion and sin. Satan: He is guilty. He belongs to me. Satan: Don’t bring him into it. truth, and the life that exposes the lies that you tell. You say you speak truth, but you speak nothing of my Son who is truth incarnate. God: His guilt has been taken away. Leave my presence! and walks out, leaving Matthew standing before his Creator). Matthew, though your sins were like scarlet, in my Son they are white as snow. I’m here to clothe you with my Son’s garment of righteousness. 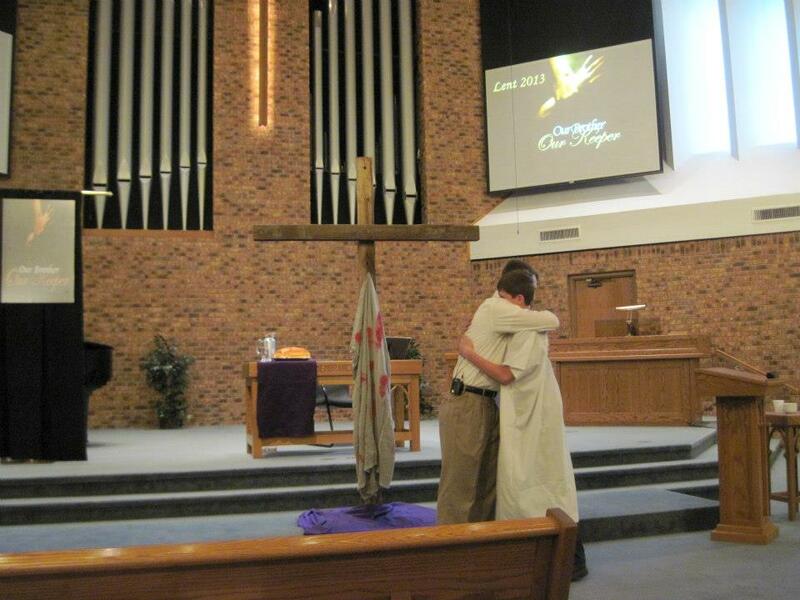 placed on the cross and the white garment is placed on Matthew). Matthew, through faith in my Son, you too have become my child. (God embraces Matthew and they walk out together).